I’ve been absent from blogging for a little while due to the demands of work, including a business trip to Moscow and a general uptick in work but I’m back now and am kicking off my return to the blogosphere with an international crime fiction week, featuring recently read crime novels from countries other than the UK (and, indeed, the US). Today’s first instalment in my criminal road trip was kindly sent to me by Black Swan and takes us not only out the UK but out of the 21st Century. Egypt: the Book of Chaos is the third volume in Nick Drake’s series of novels featuring Rahotep, Egyptian detective (or Seeker of Mysteries) in 1320 BC Thebes. Chief Detective Rahotep, having been beaten to the top job in the Thebes Medjay (the name for the equivalent of the police force), has been relegated to largely menial duties. In carrying these out, he comes across the decapitated bodies of five Nubian street boys, low-level dealers in Thebes’ thriving opium trade. Although he is warned off the case, he keeps prodding away at it and learns from his friend, Khety, that a new and ruthless gang is trying to take control of the entire drug trade in Thebes. It is not long before Khety himself turns up dead too and Rahotep resolves to destroy the gang in revenge. Before he can take steps to do so, however, his best friend and occasional employer, Nakht, the Royal Envoy, a kind of vizier or chief adviser to the king and queen, drags him into a secret mission to the kingdom of the Hittites, Egypt’s chief enemies. It’s highly dangerous but, believing that the source of the drug gang’s supply lies along the route from Thebes to the capital city of the Hittites, Rahotep accepts the mission, a decision that leads him into danger and puts him in conflict with forces trying to destroy the royal dynasty and threatens his friendships and his family relationships. 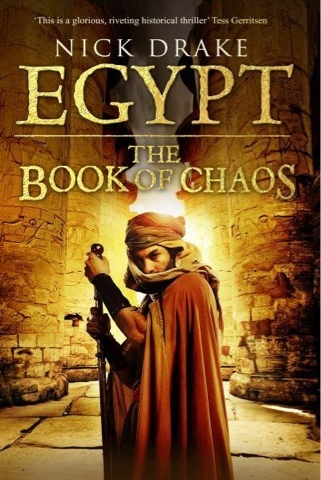 Egypt: the Book of Chaos is highly readable and, although I am almost wholly unfamiliar with Ancient Egyptian history, has a completely believable and satisfying historical feel to it. This is a good thing because it serves to distract the reader from the fact that the detective story itself is a little flat and insubstantial. Having set the scene and put the plot solidly in motion, it almost feels as if the author lost either energy or interest about two-thirds of the way through and just wanted to get to the end. Having been really enjoying it up until then, it was all a bit unsatisfying, especially as the identity of the shadowy arch-villain, Obsidian, was telegraphed well before the big reveal………and it’s fair to say that I am not normally quick to spot these sorts of things. Having said all that, it was still an entertaining read that slipped by easily and left me keen to read Drake’s two previous Rahotep novels. If you like historical fiction or historical crime fiction, I am sure you will enjoy this but it’s probably not for those of you with little interest in the genre.